Chuck 4x24 "...vs. the Cliffhanger"
My friends, I apologize for the tardiness of this recap. I spent most of last night sick to my stomach and generally feeling terrible. Joy! But, back to Chuck. You can say one thing for this show - they know how to end a season with a game changer! Before I get to that, though, in case you didn't know, Chuck has been renewed for a fifth and final season. 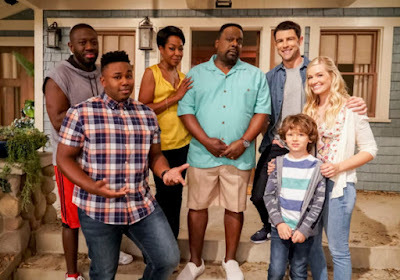 It will likely be 13 episodes, and will now be airing at 8pm on Fridays, if the new NBC schedule sticks through the summer. Sometimes they change things up, but I bet it will stay on Fridays. Which will now mean the two shows I still recap will be on the same night! Dang it! Okay, back to this finale episode. As you may recall, at the end of last week's episode, Sarah was struck down by the Norseman device. We pick right up with the gang hurrying her to the hospital. Somehow they are able to keep her from dying for a while by sticking her in an ice bath. I'm not sure why she didn't die instantly like the other dude did last week, but whatever. Ellie tells Chuck she doesn't have much time - something like 12 hours - so they have to find an antidote to this poison before then. The one person who will know the antidote, however, aside from Vivian, is locked up in maximum security, and it would take weeks before they would get permission to visit him. The him being Volkoff, of course. Chuck is on a mission, however, so he and Casey break into the prison. Only, they're too late, Volkoff has been moved. Because the CIA had been expecting something like this from them. They've put a new man on the case, a dude named Clyde Decker that would be happy to get rid of the whole team if they continue to be insubordinate. Well, as we all know, Chuck will not rest until Sarah is safe, so they have to come up with a new plan - they've got to catch the truck that's moving Volkoff before it gets to wherever it's going. The only way to get there fast enough is to use a heretofore never mentioned motorcycle called the Nighthawk that's apparently been hiding away in Castle this entire time. Right. Chuck mounts up and takes off. There's some fairly terrible green screen work behind him as he drives, but oh well. He manages to catch up to the truck and break in, only to find that Clyde has just taken the Intersect out of Volkoff's brain - leaving him the bumbling scientist Hartley Winterbottom. Chuck takes him anyway, even though he doesn't remember any of his life as Volkoff. It turns out, though, that the Norseman was a device that he was working on back before he got Intersect-ed, so he just might know a cure. Something called Irridium-5. He makes up a batch for Sarah, and while it does appear to slow down the poison stuff somewhat, it's not a cure. They surmise that Volkoff was probably working on another version, Irridium-6, and that Vivian probably has it. They've got to get to Russia! Only, by continuing on with this plan, Chuck is basically saying a big F-you to the CIA, and they're not content to let this happen. Before he and Hartley can leave, Decker manages to de-Intersect Chuck. But he's not going to give up, duh. He and Hartley head off to Russia and straight for Volkoff Industries. Though Hartley chickens out at meeting his daughter Vivian, Chuck steps up to the plate and offers up himself in order to save Sarah. Things aren't looking so good for him when Hartley shows up, just in the nick of time. They manage to convince Vivian that this isn't the life she's meant for, and that there's still time to do the right thing. Back to Burbank! Chuck gives Sarah the cure, and as we find out after a commercial break - it works. We come back to them in the midst of their wedding, sharing heartfelt vows. If things had ended here, it would've been possible to end the series, but of course then what in the world would the cliffhanger bit of the title mean? It means this - as Chuck and Sarah are driving off to their honeymoon, they discover an envelope in their limo. It's a gift from the former Volkoffs, now Winterbottoms. I knew part of the gift was going to be them now owning the Buy More, but what I didn't realize was that it really meant was they were gifted with the entire Volkoff fortune - some $877 million, or as Chuck likes to call it, a cool billion. Whoa. They decide they're going to set up their own independent spy organization with the money since they're not longer part of the CIA. And here's the second twist - Morgan finds a box of Chuck's belongings that Beckman left behind, and sees a pair of sunglasses. Uh oh, I know the whole audience knows what these are, but of course Morgan apparently hasn't a clue, and puts them on. He gets the Intersect! Will Chuck also re-Intersect himself? Or do the glasses only work once? And, finally, a bit before that, Chuck has a conversation with Decker, wherein Decker basically tells him there's been some kind of nefarious plan going on this entire time, with the Ring, Folcrum, Shaw, Volkoff, etc. leading to... something. Where? We'll find out next season.